Overall, many Latin Americans see a basic tension between religion and science. Indeed, half or more in most countries surveyed think that faith and science generally are at odds with one another. Despite the general belief that there is a conflict between religion and science, roughly half or more in most countries polled agree that humans and other living things have evolved over time. However, at least one-in-five respondents in each of the 18 countries and Puerto Rico subscribe to the view that humans and other creatures have existed in their present form since the beginning of time. Across the region, Catholics, Protestants and people who are not affiliated with any religion generally have similar views on whether there is a conflict between faith and science. But Protestants are less accepting of evolution than are Catholics or the religiously unaffiliated. The general view in Latin America is that a basic tension exists between religion and science. Pluralities or majorities in most countries hold this opinion. Roughly six-in-ten express this view in the Dominican Republic (63%), Brazil (62%) and Costa Rica (60%). Only in three countries does public opinion clearly lean in the opposite direction; at least half of respondents in Uruguay (54%), Argentina (53%) and Venezuela (53%) say there is no conflict between religion and science. Opinion is closely divided on this question in Honduras, Mexico, Panama and Paraguay. In general, Catholics, Protestants and the religiously unaffiliated do not significantly differ in their assessments of the relationship between religion and science. In Puerto Rico, for example, only a few percentage points separate the shares of Protestants (54%), Catholics (53%) and the unaffiliated (51%) who say there is a conflict between faith and science. On balance, respondents between the ages of 18 and 34 are more likely than older adults to see a conflict between science and religion. The difference between these age groups is particularly large in Costa Rica, where 68% of younger adults (ages 18-34) say science is generally at odds with religion, compared with 53% of those ages 35 and older. Catholics tend to be more accepting of evolution than are Protestants. 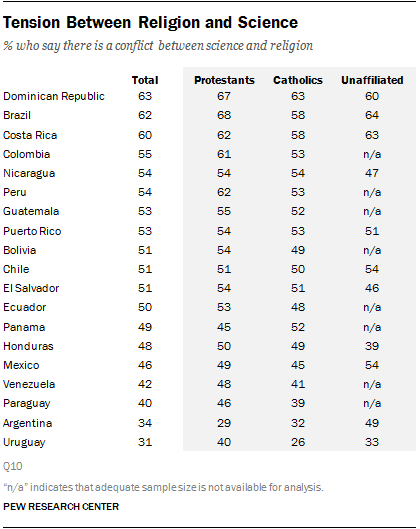 Differences between the two groups are particularly wide in Peru and Venezuela, where there are 20-point differences in the percentages of Catholics and Protestants who express a belief in evolution. 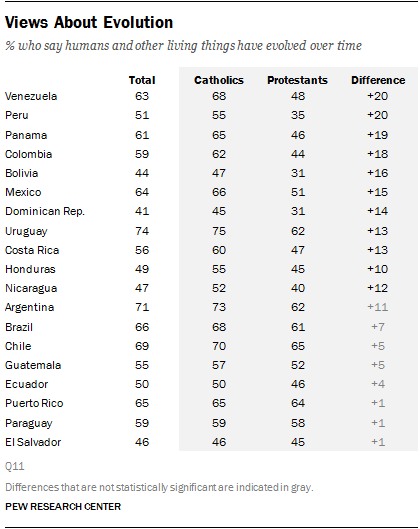 Large gaps between Catholics and Protestants over beliefs about evolution also are found in Panama (19 points) and Colombia (18 points). In a few places, including Puerto Rico, El Salvador and Paraguay, Catholics and Protestants express nearly identical beliefs about evolution. In countries where adequate sample sizes of urban and rural populations are available for analysis, people living in urban areas tend to be more likely than rural residents to say that they believe in evolution. The gap between the views of urban and rural populations is especially wide in Peru, where 56% of city dwellers say they believe in evolution, compared with 32% of rural residents. Honduras is the only country polled where rural residents are more likely than their urban counterparts to say that humans and other living things have evolved over time (53% vs. 44%). Generally, people with more formal education are more accepting of evolution. This is especially true in Bolivia, where 52% of adults who have completed at least a secondary school education believe in evolution, compared with 35% of those with less education.